Turn an average gathering into a culinary extravaganza with these Cucumber Avocado Roll-ups. These vegan-friendly appetizers are filled with a blend of avocado, fresh basil, and tangy lime, and they’re deceptively simple to put together. A sprinkling of smoked paprika adds color and a gentle spiciness. Each roll has less than 35 calories, so you can enjoy a few without filling yourself up for the main course. Tip: This recipe suggests making the avocado mixture in a blender, but if you’re whipping up a batch of these for yourself, a good mashing with a fork will do the job. 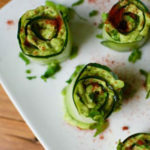 These vegan Cucumber Avocado Roll-ups are deceptively simple to put together made with fresh basil, buttery avocado, and crisp cucumber. Place avocado, basil, garlic, and lime juice in a food processor (or blender). Season with salt and pepper if desired; pulse until smooth and creamy. Set aside. Use a vegetable peeler to peel off long, thin slices of cucumbers. Spread avocado mixture evenly on each cucumber slice. Pick up one end of the cucumber slice and roll cucumber loosely around the filling. End with the seam on bottom and secure with a toothpick.